Another Irish today. We'll head to Japan tomorrow. 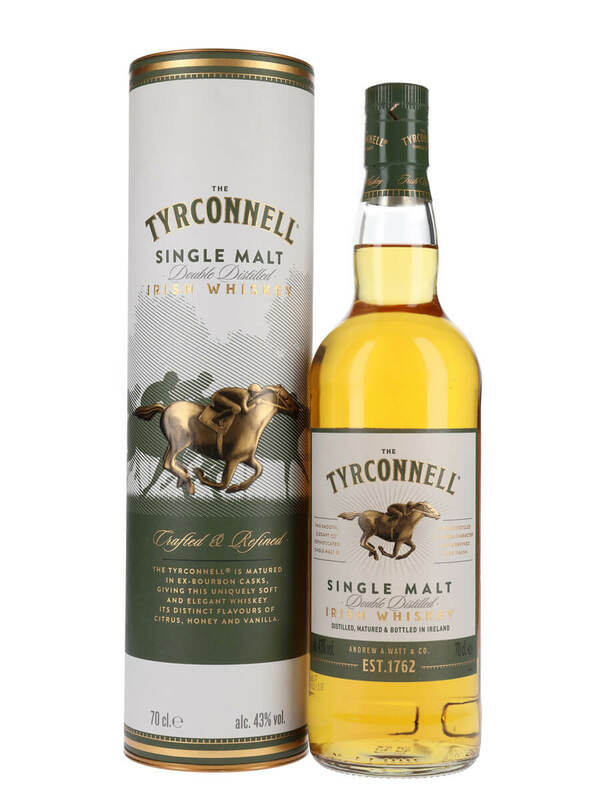 Named after a racing horse, The Tyrconnel (tire-kon-ill) was the flagship brand of the Watt distillery (1762). It was a bestselling whisky in the US before prohibition and didn't survive into the post-war period. Ireland's only independent distillery, Cooley Distillery, has recreated the brand and it is now the fastest growing Irish single malt and a real award winner, most recently having its 10yo Sherry finish win "Top Irish Whisky for 2007" at the Malt Maniacs Awards. Sweet fresh apricots, oats and malt. Slightly phenolic with magic markers and ash. Big maltiness, rich breadiness that is quite toasty. Grilled cheese sandwich. Hay. Simple, malty, and easy drinking. Feels like it is on the verge of exploding with heights of flavours, but never really takes off. But this is not necessarily a bad thing. Rounded, straighforward, very pleasant and hearty whisky.